Women in a community in southern Mexico have voted in local elections for the first time, after winning a three-year battle for the right to choose a mayor and councillors alongside their male relatives. Women have had the vote in Mexican presidential, general and regional elections since 1953, but the persistence of traditional law in parts of Oaxaca state means many towns have men-only voter lists for local polls, El Universal newspaper reports. But in 2013, a group of 11 women in the town of Guevea de Humboldt successfully challenged the law in a regional electoral court. Oaxaca's state assembly decided against re-running that year's election because of "local conflicts", Reforma newspaper says. Instead it appointed an interim administration, and fresh elections were finally announced for this week. About 500 women voted in the town of 5,000 people, and three women stood for a council seat. 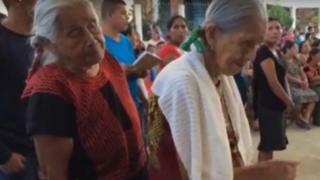 Catalina Martinez Jimenez is, at 75, one of the oldest women to vote, and made it to the polling station with the help of her son and a makeshift walking stick. "This is a miracle of God," she told reporters. Another newly-enfranchised pensioner called Gliseria said it was hard to believe that the women of Guevea could choose their own mayor at last. She said she would take a break from making tortillas to cast her vote later, adding: "This may be my only time, because who knows whether I'll be around for the next one." But not all the town's women turned out to vote. Reforma says some object to voting by ballot, insisting that only the traditional method of show of hands will do.